We, the heads of Churches in charge of the Holy Sepulcher and the Status Quo governing the various Christian Holy Sites in Jerusalem - the Greek Orthodox Patriarchate, the Custody of the Holy Land and the Armenian Patriarchate - are following with great concern the systematic campaign against the Churches and the Christian community in the Holy Land, in flagrant violation of the existing Status Quo. The systematic campaign of abuse against Churches and Christians reaches now its peak as a discriminatory and racist bill that targets solely the properties of the Christian community in the Holy Land is being promoted. This abhorrent bill is set to advance today in a meeting of a ministerial committee which if approved would make the expropriation of the lands of churches possible. This reminds us all of laws of a similar nature which were enacted against the Jews during dark periods in Europe. This systematic and unprecedented attack against Christians in the Holy Land severely violates the most basic, ab antiquo and sovereign rights, trampling on the delicate fabric of relations between the Christian community and the authorities for decades. 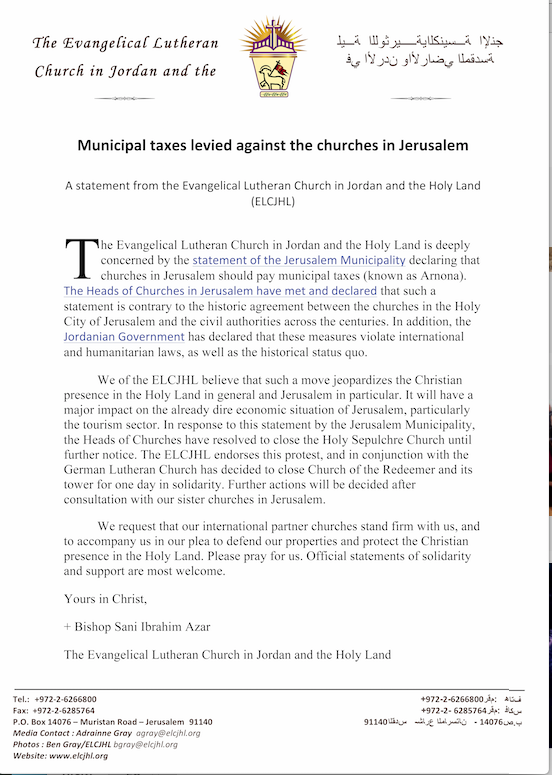 UPDATE: The Evangelical Lutheran Church in Jordan and the Holy Land has issued this statement, announcing its decision to close the Church of the Redeemer in the Old City of Jerusalem, in solidarity with the decision regarding the Church of the Holy Sepulchre.